I had asked people interested in supporting my efforts to attend. If we lost this hearing, there would be no trial next month. This proved to be a good idea, as we won a hollow victory and there will be no trial next month. But the support I received gives me and my lawyer motivation to keep fighting. The first thing I noticed, even going into the building, was how crowded it was. There was a lengthy line just to go through security. Many of the people there to attend my hearing that afternoon, some of whom recognized me. I was even offered the opportunity to cut the line. I declined, but it does make me feel like a celebrity! When we got off the elevators, the hallway to the courtroom was already full. People I had never met before gave me buttons that said “Show Me The Votes” and bumper stickers that said “Protect Democracy DEMAND A *PAPER* BALLOT”. The courtroom was crowded. Even the jury box was full and extra chairs were brought in. Even so, some people were forced to stand. The judge came out and commented that there were more people there than in similar hearings for all of his previous 26 years combined. News reports said over 100 people attended. I even heard there were people outside unable to get into the courtroom. Judge Lahey started the hearing by detailing my previous court actions of the case. I had been representing myself and filed the lawsuit based on the denial of an open records request. Prior to filing the lawsuit, I had requested a recount of all the ballot questions (only candidates can file a recount request for races), within the required time frame, and had been denied. I then filed the open records request which was also denied. My lawyer shifted the basis for my lawsuit from an open records request to a recount request. In Kansas, ballots are specifically exempted from open records requests and these records were ruled to be ballots in the 2013 case I lost. Kansas law also states that the person requesting the recount is allowed to specify both the precincts they want recounted and the method of recounting. Note: Some readers have requested I post the motions. I only have paper copies and they are rather lengthy for me to scan one page at a time on my home printer. My lawyer has graciously offered the use of his automatic scanning machine to create those files, so I will post them when I get that done next week. #20: RTAL are paper strips loaded in voting machines. Their function is to allow the voter to confirm his or her vote on any candidate or question by comparing his or her choice with the paper strip that is shown in a small portal or window in the voting machine itself. I disagree with this because that is not their only function. These records are used both to verify accuracy and for recounts in other states using this type of equipment. They were even used for a recount of a race in a 2006 election in Sedgwick County. #22: The selections of individual voters can be determined if the time of the vote, the voting location and the machine used is known by a person making a request under KORA. RTAL could be used for this purpose. I disagree with this *fact* because while it is plausible theoretically, it was not actually possible for the specific polling station and election I requested. Therefore, it is not true with respect to my lawsuit. Mr. North, attorney for the plaintiff, made the first argument. He describes the RTAL (VVPAT) records. Then he both poses and answers the question “Why not allow it?” Because, he says, there are criminal prohibitions against doing so. 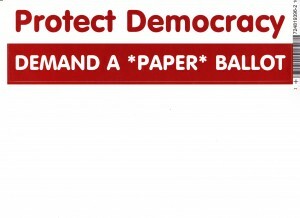 That they have the contents of ballots and even if you can’t identify the individual who cast the ballot, that disclosure is still prohibited by law. The only exception is for contesting elections. The Judge asks why not? Mr. North says that recounts only get disclosed in election contests. The information is not subject to KORA claims and that mine was not a ‘real’ recount request. While it is correct that I was not seeking to overturn the election results, but to examine the RTAL records. I have made no secret of this motivation. I am willing to formally contest the election results in order to access those records. My motivation for doing so should not affect my right to contest the election. The judge apparently agrees with me on that because he then forces Mr. North to admit I have do have standing to get a recount of ballot questions regardless of my motivation for requesting it. Mr. North states that does not mean I can access RTAL records. Mr. North argues that they can’t do a recount using RTAL records because it would be a violation of open meetings law. He claims statute limits recounts to previous used method – optical scanners or manual hand-count. For election machines you can reuse memory cards or print out ballot images which are manually recounted. Neither of those options are acceptable to me. In fact, I find it seriously concerning that we don’t have a full paper trail, only the RTAL records, from which a ballot can be reconstructed. Anything stored electronically is useless in determining if the voting machines and scanning machines and their software instructions are providing us with accurate vote counts. RTALs are perfect, but they are the best we have in Sedgwick County and more than other places, like Johnson County and South Carolina. Mr. North discusses different interpretations of the law with a policy that specifically does not endorse use of RTAL records. He spins a hypothetical scenario that the RTAL can’t trump other methods for recount. His hypothetical involves a losing candidate who insists on a recount using RTAL and is afterward declared the winner. The previous winner but now loser then requests another recount using the original method and the count reverts back to the original numbers, making him the winner again. The loser then requests another recount using RTAL records. Mr. North claims this could go on indefinitely with no way to resolve the situation. I don’t know whether to conclude Mr. North doesn’t understand that when you get two different results, you have to do the work of understanding why they are different before coming to a conclusion of which is correct. You don’t just repeat the two processes ad infinitum; that’s stupid and wasteful. Or if he is unwilling to acknowledge that different results when comparing the RTAL to the electronic counts imply a compromised voting system that needs to be fixed. I found his argument horrifying because it amounts to deliberately sacrificing accuracy of the vote counts in favor of accepting the outcome of a rigged election in order to allow a winner to be declared. If there was an outcome altering discrepancy between the RTAL records and the electronic vote counts that cannot be resolved, either the RTAL records should be used as the more direct indication of voter intent or the election needs to be held again. Mr. North also asks the judge to dismiss for lack of jurisdiction because the time frame is too late for a recount. The judge questions that last argument. Finally, Mr. North says my credentials don’t matter a whit because no one is allowed to see those records ever. It’s against the law to allow it. That last is a lazy paraphrase, he was far more articulate about it. However, it captures the essence of what he said. My lawyer, Randy Rathbun, is up next. He starts by saying I’m a brilliant statistician but a horrible lawyer. He has changed my nature of my lawsuit from a KORA (Kansas Open Records Act) request to a recount request, admitting that these records are excluded from KORA. However, I properly requested a recount after the Nov. 2014 election and have a right to the use of RTAL to conduct a recount. I was improperly refused by the plaintiff. His argument is that nothing in the law that prohibits the use of RTAL in recounts. They are used in recounts elsewhere and they have been used in Sedgwick County previously. He cited a case from 1968. He said this court has the power to force the election commissioner to follow the law. Then the judge questions him about the Kansas Open Records Act. Randy agrees that I am not entitled to look at the ballots under the open records act but that they can be looked at during a recount. The judge asks him why doesn’t Judge Vining’s ruling stand? Randy responds, but apparently not convincingly because this was the part we lost on. After Randy is finished, Mr. North is given the opportunity for rebuttal. He claims that ballots are not part of the open records even in recounts. The judge asks him, can he (the judge) order a recount? Mr. North argues that he cannot. He doesn’t think judge has jurisdiction and cites a case from the Grant administration. At one point, the judge mentioned that it might be worth doing in order to give voters more confidence in the results. Mr. North denigrated the idea of doing so for such reasons. He ends his oration with the claim that Kansas does not require use of RTAL records in recounts. It’s true that Kansas, unlike some other states, does not. I don’t see why that’s pertinent because Kansas law does not forbid it either. Then there is a recess while the judge studies the cases cited and makes his determination. I am able to meet a few people in the halls. I am overwhelmed, not just by the numbers, but by the ardor of my supporters. They have the same level of caring that I do about whether or not our votes are being counted accurately and are grateful to me for trying to bring transparency to vote counting. When the judge returns, he commends both lawyers for well written briefs. He disagrees with the defendant comments regarding my request for a recount. He scolds Mr. North for suggesting that the defendant can ignore her responsibility to provide a recount and then dismiss my suit with the claim that the time frame for conducting recounts has passed. I have the right to sue for a recount. However, he finds that my request is the same issue as previous lawsuit. The defendant’s argument of “Collateral Estoppel” holds; I will not be permitted access to RTAL records. So I can go to trial to get a recount, but the trial is limited to a recount of ballot questions and he won’t allow access to RTAL records even if I win permission to do a recount. I don’t really understand this ruling. Randy has to explain it to me more than once. My final understanding is this: I am allowed to go to trial because my request for a recount using the RTAL records was improperly denied, but even if I win at trial, I would not be allowed to force a recount of the RTAL records, thus negating the purpose of my lawsuit. The reason for this denial is that I asked to see those records for a previous election in my previous lawsuit and lost. This reasoning makes no sense to me, but I’m admittedly a terrible lawyer. Randy has promised to file an appeal. The appeal process will take approximately a year. The trial next month is cancelled. He will also request the judge order that the 2014 RTAL records not be destroyed prior to this case being resolved. Previous Previous post: After February Hearing, What’s Next?